Haircuts notoriously are a danger zone with autism. In recent years through social media theres a lot of effort from hairdressers and barbers to empathise with the difficulties felt by those with autism and work where possible through those difficulties. I’m not sure with haircuts what the issues specifically are; I think it’s the sensory overload of the environment, hair dryers, the music in the background, combined with the noise and sensation of the cutting of the hair. It used to look as if it was physically painful for Dylan to have his hair cut. He would sit and allow us to do it but he would cry. Literally sob with every snip of the scissors until the cuttings stuck to the tears on his face and he became an uncomfortable hairy, snotty mess. He would pull at the skin on his face with his fingers; partly to remove the itchy hair but also to distract him from the discomfort of the hair cut. He would pull at his face until it was bruised. The fallout of a haircut was impossible to manage at a hairdresser. Dylan would sit and let me cut but scream and wail, we would both end up sobbing. I never thought he was being naughty; it always occurred to me that Dylan just couldn’t manage having his hair cut. Likewise I just didn’t know what to do about it. I dreaded it in those days, haircuts used to occur every 6 months; only when Dylan’s hair would be too long and thick for him to see through it. I would sit him down and I try and prepare him and I would try and cut his hair. 3 years ago we had a whole ABA programme dedicated to the desensitisation of the sound of scissors cutting. 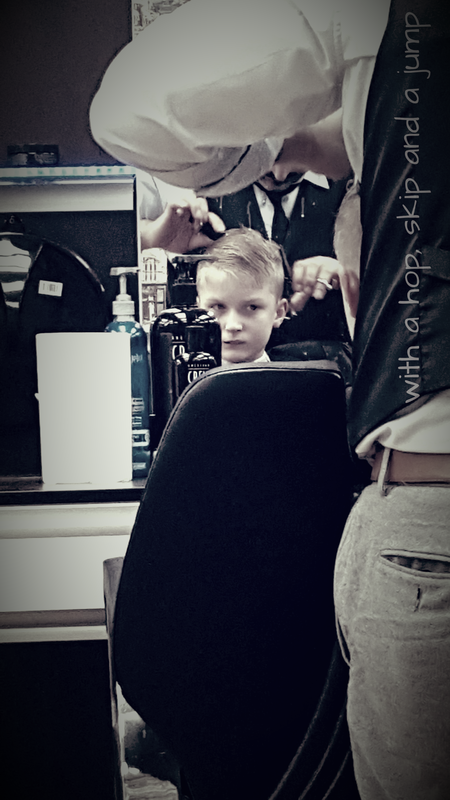 It saved Dylan from the perpetual fear of haircuts and saved me from the psychological misery of having to inflict this misunderstood anguish on my darling boy. Haircuts have not always been as manageable as they are now but we’ve put a lot of work into it. Here we are 3 years later Dylan independently having his hair cut with scissors *and* clippers. After months of desensitisation of holding the scissors, hearing them cut, having them cut closer to his ears so he can hear it clearer. Having his hair sprayed with water, having his hair combed. It look a long patient time but eventually it all beautifully pulled together to make a successful haircut. After this haircut and with support and prompting he took his IPad to the barber and told him ‘thankyou’.